We are now accepting new patients. Call today! *We also work with a number of other ailments not inculded on this list. So what is Traditional Chinese Medicine? It is the use of acupuncture, Chinese herbology, Tui Na (massage techniques), and Qi Gong (energy cultivation and transfer). We practice the first two modalities in our office. Traditional Chinese Medicine is a method of evaluating a person's health utlizing pulse and tongue diagnosis, as well as taking into consideration all possible symptoms that might be present. With the information gathered, a Chinese diagnosis and treatment strategy is developed. When we remember that the human body is abundant energy, it is easy to understand how Chinese medicine works. This energy that I am talking about is called Qi. Your body makes this energy out of the food you eat and the air we breathe. It is present from the day you were conceived to the day you die. It is in constant motion throughout the body feeding all tissues and maintaining life. It is when the energy becomes disrupted by the stressors in life that our body begins to move into dysfunction. If the dysfunction is there long enough, it turns into disease. Balancing the body's energy is the way Chinese medicine restores health. It is much like tuning a radio. When your energy is out of balance, it is the equivalent of hearing static through the speakers. When the acupuncture points are stimulated or herbs are taken, it is essentially tuning the radio so that the music is heard loud and clear. The clear music represents ideal health and vitality. 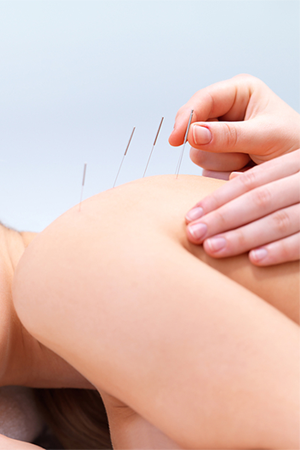 Acupuncture is an Eastern form of medicine that originated in China. It involves the insertion of extremely small needles into specific points on the body to target specific health problems. It is nearly painless and provides tremendous relief. With the use of laser stimulation, acupuncture can also be performed in our office without the use of needles for those who are sensitive. Dr. Carlson is a board certified and licensed acupuncturist with a masters' degree in acupuncture. There are 14 basic acupuncture channels called meridians that traverse the entire body. They travel down the arms and legs, all around your trunk, and into the head. The channels also move inwardly to connect with all the organs of the body. There are 364 traditional acupuncture points throughout each of the 14 channels. When the points are stimulated with needles, finger pressure, and laser to name a few, an energetic change is made within the body that in turn creates a physical change in how our bodies work. Chinese Herbal Medicine is a 4-5000 year old art. There are thousands of Chinese Herbs that are put together in different combinations to make traditional formulations. The countless formulas that have been designed through the development of this art can be used to treat practically any health condition. They include pains anywhere in the body, high blood pressure, menopause, digestive disorders, infertility, stress, anxiety, depression, organ disease, and more. Dr. Carlson is a board certified Chinese Herbalist with a master's degree in Chinese Herbology. Visit our tranquil facility for a variety of non-invasive, drug-free treatments that improve your health. We have six private acupuncture rooms and every member of our staff is dedicated to ensuring you a comfortable, pain-free experience.